For use on sore neck or shoulders, aches from repetitive strain, or muscle fatigue after a workout. Rollers on hook end and handle. Dimensions: Folded: 15" x 6"; Opened: 17.5" x 12.5"
Our son in law loves it. My BF is in love! Sturdier and more comfortable to use than I expected. When you’ve got a knot in your back, a kink in your neck, or a sore leg muscle, sometimes the best remedy is to work it out on your own—with a little help from PTFit. PTFit’s massagers have a peculiar shape, but there’s no mystery about their effectiveness. They’re designed to help you apply just the right amount of pressure in just the right spot. When you can’t get to a massage therapist, PTFit’s massagers can relieve muscle tension and soreness, even in hard-to-reach areas. PTFit’s original massager is the Finnhook, a rigid, hook-shaped tool that’s ideal for treating trigger points, or knots in the muscle. 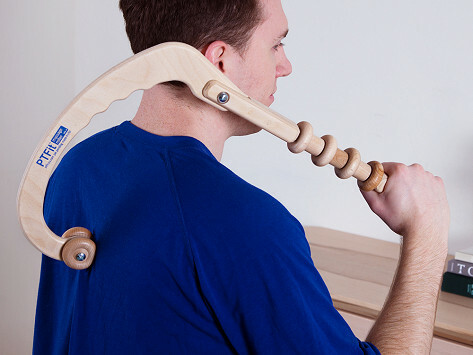 It was developed by Jukka Heininen, who wanted to give people who suffer from neck and shoulder pain a way to massage those areas on their own. PTFit founder Dale Niggemann, who’s an engineer with an interest in wellness, discovered Finnhook in Finland and brought the design to the U.S.
For more versatile massage options, Dale modified the Finnhook to create the PTFit Multi-Roller, which adds rollers to the design. The sturdy handle lets you control where you roll the massage wheels—on your neck, shoulders, back, calves, thighs, and anywhere else you need relief. Both tools are made in Stevens Point, Wisconsin, from birch plywood, and they’re foldable for easy transport. Whether you’re nursing a nagging injury, experiencing muscle fatigue after a tough workout, or simply unwinding after a long day, the Finnhook and Multi-Roller give you the leverage you need to roll, relax, and recover.